The Novara CP-3008 ControlPad with built-in Ethernet port combines a controller with an easy to use 8-button keypad that mounts into a standard two gang US, UK, or EU back box. Setting up the Novara 3000 Series ControlPads is simple using Novara Device Configuration Software (DCS) and requires no programming. The Novara ControlPads built-in IR, RS-232, relay and I/O ports can be configured to control volume, input selection and power for a wide range of A/V devices including projectors, DVD players and switchers. Easily connect to AMX's Resource Management Suite which enables web-based remote diagnostics and management through the built-in Ethernet Port. 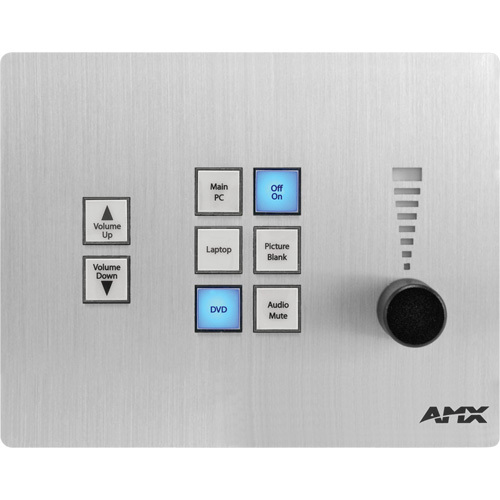 The Novara 3000 Series ControlPads are available in Black, White and Aluminum finishes.